Malawi’s president has set up a commission this week to investigate “Maizegate,” a deal involving the recent purchase of maize from neighboring Zambia. Controversy was sparked in November when a local newspaper in Malawi published leaked documents that suggested possible irregularities during a government purchase of 100,000 tons of the staple crop from Zambia. Malawi has been importing maize to avert food shortages after flooding and drought wrecked last year’s harvest. The leaked documents indicate Malawi’s state-owned grain trader, the Agriculture Development and Marketing Corporation, or ADMARC, bought a large consignment of maize for $34.5 million from a private Zambian trader. The records allege that ADMARC could have purchased the maize directly from the Zambian government for $21.5 million. 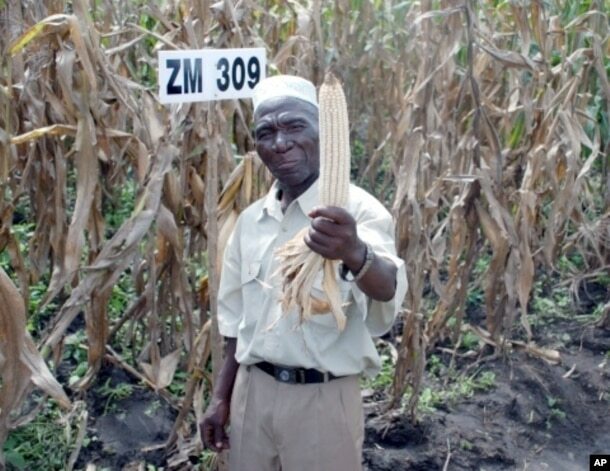 Farmer Bamusi Stambuli from Balaka, Malawi, shows off a healthy ear of maize, a staple crop for more than 900 million people worldwide. ADMARC and Malawi government spokesman Nicholas Dausi deny those allegations. ADMARC officials obtained a court injunction restraining The Daily Times, the local newspaper which published the leaked document, from further reporting on the maize imports from Zambia. “Maizegate” has prompted a group of 18 civil society organizations called the National Advocacy Platform to push for greater transparency in the maize procurement process. “There are suspicions that some steps were not followed,” said Billy Mayaya, a rights activist. The National Advocacy Platform wrote an open letter to President Peter Mutharika asking him to suspend Agriculture Minister George Chaponda, who is accused of direct — and illegal — involvement in the maize purchase. In a press statement Wednesday, Chaponda said his only involvement was in early December when he met with the president of Zambia to discuss the status of the deal, after Zambia announced that it had banned maize exports. Chaponda told local radio station Zodiak Broadcasting Service that he will weather the storm. Meanwhile, the commission of inquiry is expected to submit its findings to the president at the end of the month. But it may not end there. In Zambia, leaders of the opposition United Progressive Party, president, Saviour Chishimba, claims they evidence of corruption in maize exports. The party said in a press statement that it presented that evidence to Zambia’s Anti-Corruption Commission on Thursday for action. I’m passionate about understanding humanity and the environment we live in. I want our generation to be known for something incredible. I graduated in journalism and public relations, I have a blog where I document and write about environmental issues affecting the Southern Africa Development Community (SADC). I have had the privilege of visiting Scotland, Italy and South Africa. Because traveling to me is adventurous; especially making new friends. In addition to writing about arts, environment and culture, I also advocate for women’s rights and empowerment in the Southern part of Africa. Somalia’s Mohamed Abdullahi Farmajo chosen as president, in a vote held in an aircraft hangar. Zambia: IMF holds talks with Over possible aid programme.